Picture yourself relaxing on a calm quiet beach, a book by your side and a mesmerizing view of the tangerine sunset; the water glistening like a million moons dancing on the sound of waves and the sun sleeping on an aquatic bed as the skies create a blanket of orange and gold. Pack your bags and head to the tranquil beaches in Maldives, which is indeed in the top ‘must-visit’ list for beach lovers. It is located in the Indian Ocean, about 500 kms from Sri Lanka and India features a group of 1,192 exquisite coral islands. Did you know that Maldives is one of the world’s most dispersed countries due to its archipelago spread of over 90,000 square kms? Interesting, isn’t it? So, listen to your travel bug and choose from our Maldives packages now. 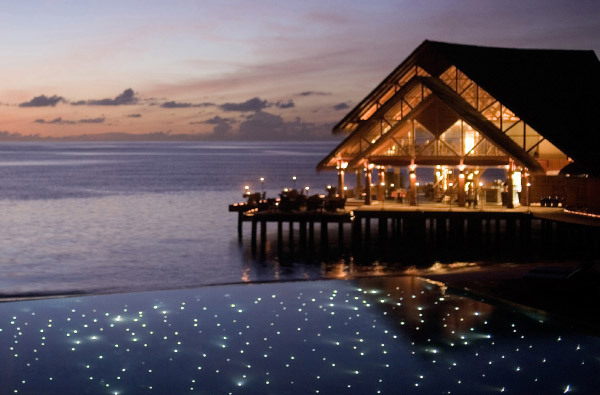 Once there, you have endless things to do in Maldives. However, here are the top 10 must-do things in Maldives which you shouldn’t miss. 1. Bet on your favourite crab in the hermit crab race. 2. Dive in the crystal clear waters, swim along with the sea turtles, sharks, stingrays, barracudas, whale and see the most picturesque corals at the Kurumba Island. 3. Fish for your own supper at the Kuda Bandos’ night fishing excursion on a Dhoni, the traditional fishing boat. 4. Go on a dolphin cruise as the sun musically sets in the background. 5. Pamper yourself with a rejuvenating spa at the Taj Exotica Resort & Spa or Anantara Resort & Spa. 6. Go on a night beach walk and witness the ocean of stars formed due to the bioluminescent phytoplankton. 7. Watch the sharks swim over you as you dine in the world’s first undersea restaurant, Ithaa by Conrad Hotels. 8. Dive in Banana Reef – the first dive site discovered in the Maldive islands. 9. Take a visit to the oldest mosque in the island – Hukuru Miskiiy (Old Friday Mosque), dating from the late 1650s. 10. For an unforgettable underwater experience, dive to the Maldives Victory Wreck (which sank in 1981), lying on the western side of Hulhule. This is a dive for experienced divers.